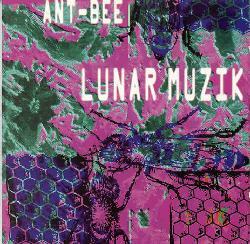 Ant Bee - "Lunar Muzik"
Did you ever lie awake at night straining to imagine what kind of music would result from a collaboration that included Daevid Allen, Harvey Bainbridge, the original Mothers Of Invention, and the original Alice Cooper Group (minus Vince)? Well Ant Bee's "Lunar Muzik" puts this question to rest once and for all. The core of Ant Bee is North Carolina resident Bill James who seems to function as chief organizer and ideas man. According to the promo material James has been a student at the Berklee College of Music, done transcriptions for Frank Zappa, and written a 900 page book on percussion. All this is interesting to note while listening to the psychedelic, sound manipulating, good time that is "Lunar Muzik". Many of the songs are very pop-psych and will be instantly loved by 60's fans. The music has that dreamy quality and drugged out harmonies that characterized the songs of that era. There is also lots of the same innocent experimentation like tape manipulations and sound collages that 60's pop-psych explored. There are even covers of the Monkees' "Love Is Only Sleeping" and the Stones' "Child Of The Moon". Among the Mothers' contributions are "Snorks & Wheezes", "Son Of Snorks & Wheezes", and "Silicone Hump". The liner notes describe "Snorks & Wheezes" as "my grand tribute to the Mothers Of Inventions" and indeed they are that. Snorks opens with classic Mothers do-wop harmonies as sung by the Chipmunks, and then goes into an interesting spacey synth journey. "Silicone Hump" hails back to the early era of quirky, orchestral, Zappa compositions. What makes this disc of interest to space fans is the presence of Daevid Allen and Harvey Bainbridge. Bainbridge contributes a synth exploration to a larger work called "By-And-By I Touch The Sky", which is described as "my supergalacticpsychomysticfreakyorgasmic concept piece - sort of". Surrounding Harvey's segment with more of Aunt Bee's pop-psych makes the whole thing very surreal. "Diva Gliss" offers several minutes of Daevid Allen's floating glissando guitar accompanied by synth. Due to the collage-like nature of the music the whole work should be listened to in a single sitting. Otherwise, the psych "songs", the Mothers contributions, and the Allen/Bainbridge pieces would seem out of place with one another. Overall, though I find this to be a really fun and good humored collections of songs. You can visit the Ant Bee at their web site.